Raleigh Myers was born on May 6, 1922, in Aulander, North Carolina. He enlisted in the U.S. Army Reserve on September 19, 1942, and entered the Aviation Cadet Program of the U.S. Army Air Forces on March 6, 1943. Myers was commissioned a 2d Lt in the U.S. Army Air Forces and awarded his pilot wings on December 5, 1943. He completed B-17 Flying Fortress training and then served in the continental U.S. for the rest of World War II. Capt Myers served in the Philippines from March 1946 to March 1947, and he reverted to enlisted status as a Master Sergeant to remain on active duty on March 23, 1947. He then served as an Air Operations Specialist before being recommissioned as a Captain in the U.S. Air Force on September 27, 1950. Capt Myers served as a squadron commander from September 1950 to November 1951, and then as a B-26 Marauder pilot in the U.S. until January 1953, and deployed to Korea from January to August 1953. During this time, Major Myers flew 42 combat missions with the 95th Bomb Squadron of the 17th Bomb Group during the Korean War. His next assignment was as a B-47 Stratojet pilot from January 1954 to August 1957, and then as a B-47 pilot and Operations Officer for the 487th Bomb Squadron at Whiteman AFB, Missouri, from August 1957 to October 1959. Major Myers then served as a U-2 Dragon Lady pilot and Operations Officer for the 4028th Strategic Reconnaissance Squadron of the 4080th Strategic Reconnaissance Wing at Laughlin AFB, Texas, from October 1959 to December 1961. During this time he made his maiden flight in the U-2 on November 30, 1959. His next assignment was as Chief of Air Training and then as Chief of the Training Division with Headquarters 4080th Strategic Reconnaissance Wing at Laughlin AFB from December 1961 to July 1963, and then at Davis-Monthan AFB, Arizona, from July 1963 to October 1965. During this time, Lt Col Myers participated in operations in support of the Cuban Missile Crisis in 1962, and he deployed to Bien Hoa Air Base, South Vietnam, from September to December 1964. In Vietnam, he worked on a highly classified mission to facilitate U-2 flights, and to develop the Ryan Firebee Drone and then DC-130 drone carrier. His next assignment was as Assistant Deputy Commander for Operations of the 4080th Strategic Wing from October 1965 to June 1966, and then as Assistant Deputy Commander for Operations of the 100th Strategic Reconnaissance Wing at Davis-Monthan AFB when the personnel and aircraft of the 4080th were transferred to that new Wing. 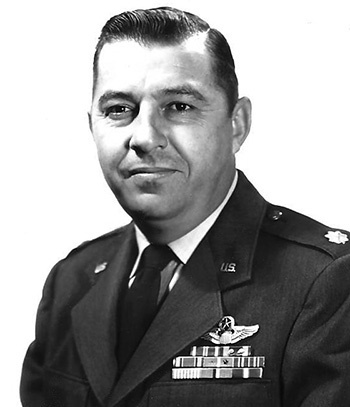 Lt Col Myers final assignment was as Commander of the 100th Organizational Maintenance Squadron at Davis-Monthan AFB, where he retired from the Air Force on May 1, 1967. Raleigh Myers died on August 10, 1971, in Elizabeth City, North Carolina, and was buried at the Raleigh National Cemetery in Raleigh, North Carolina. 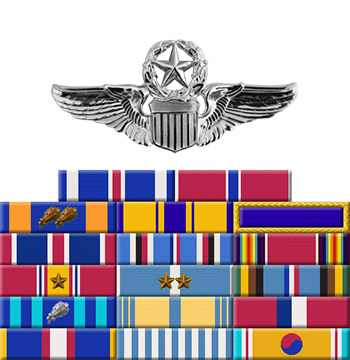 Major RALEIGH BEECHER MYERS, JR. distinguished himself by extraordinary achievement while participating in aerial flight over enemy held North Korea on 1 July 1953. Flying as a pilot of a B-26 type aircraft, 17th Bombardment Wing (Light), Fifth Air Force, engaged in a night rail interdiction mission. Major MYERS displayed outstanding airmanship and flying skill. In the vicinity of Changmun-ni, Korea, an enemy train was sighted moving southward. Fourteen bombing and extremely low level strafing passes were initiated despite fire from enemy automatic weapons and adverse weather conditions restricting visibility in the target area. On the second pass two boxcars were hit by bombs and left burning. On the fourth pass a rail cut was accomplished and the fifth pass resulted in the destruction of three additional boxcars. Having expended all the bombs Major MYERS attacked the now brightly burning train with his wing guns and these attacks produced a blue-white secondary explosion, a large jet of steam from the locomotive, and three sustained fires. The final results of the mission were ten boxcars destroyed, four boxcars damaged, and one locomotive probably destroyed. These results were confirmed by the crew of another aircraft which observed the blazing wreckage of the train. As a result of this highly successful mission vital enemy supplies and transportation facilities were destroyed. By his high personal courage and devotion to duty, Major MYERS brought great credit upon himself and the United States Air Force.